The KMLabs Cascade™ Ti:sapphire laser oscillator provides higher energy and adjustable repetition rates by utilizing a cavity-dumping technique. An acousto-optic-modulator (AOM) dumps high energy pulses out of the cavity at rate that can be adjusted by the customer from 40kHz to 4MHz. 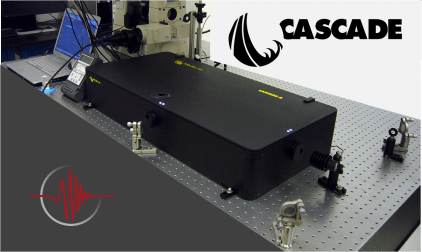 The Cascade produces >30nJ, <15fs pulses useful for a wide range of applications including ultrafast imaging, harmonic generation, and pump-probe spectroscopy. The Cascade’s user-adjustable repetition rate allows customers who do pump-probe based experiments to control the time between subsequent pulses in their experiment enabling the study of samples which require longer times to return to an equilibrium between pulses. Another unique advantage of the Cascade is that it includes a standard, non-dumped output at a repetition rate of ~80MHz. This additional lower energy output can be used for more traditional applications or in combination with the higher energy dumped output. KMLabs has been building this integrated system for over a decade. The interaction between light and nano-scale matter has been used in various scenarios, thanks to the enhancement of the light’s electric field in reponse to plasmonic resonances of the nanostructures. Harmonic generation from these nanostructures can be more prevalent when the nanostructures are asymmetric on either inter-particle or intra-particle levels. In this work, the Authors use a KM Labs Cascade Ti:Sa oscillator to irradiate Archimedean nanospirals with subwavelength dimensions. The nanospirals emit second harmonic radiation, and by altering the polarization state of the driving radiation, control of the SHG intensity is achieved. The controllability and conversion efficiency of the SHG, enables this technology to be used for all-optical control applications. Regenerative medicine investigates the ability of in-vivo self repair. One such aspect is understanding and then fostering the circumstances in which repair is accomplished. An example of this is the repair of neurons severed by injury, disease or mircosurgery. In this work, the Authors perform microsurgery on neurons to emulate damage. The use a KM Labs Cascade Ti:Sapphire laser oscillator to perform the surgery.